Flowers are calling to all the animals of the forest, Drink me! but it's the pollinators who feast on their nectar. In rhyming poetic form and with luminous artwork, this book shows us the marvel of natural cooperation between plants, animals, and insects as they each play their part in the forest's cycle of life. 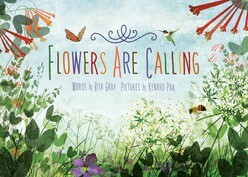 In this rhyming poetic picture book, explore the wonders of natural cooperation between plants, animals and insects.